By shining a laser along the inside shell of an incandescent light bulb, physicists have performed the first experimental demonstration of an accelerating light beam in curved space. Rather than moving along a geodesic trajectory (the shortest path on a curved surface), the accelerating beam bends away from the geodesic trajectory as a result of its acceleration. Previously, accelerating light beams have been demonstrated on flat surfaces, on which their acceleration causes them to follow curved trajectories rather than straight lines. 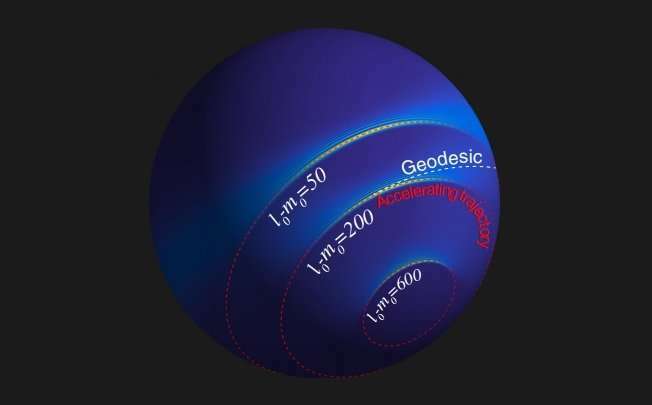 Extending accelerating beams to curved surfaces opens the doors to additional possibilities, such as emulating general relativity phenomena (for example, gravitational lensing) with optical devices in the lab. The physicists, Anatoly Patsyk, Miguel A. Bandres, and Mordechai Segev at the Technion – Israel Institute of Technology, along with Rivka Bekenstein at Harvard University and the Harvard-Smithsonian Center for Astrophysics, have published a paper on the accelerating light beams in curved space in a recent issue of Physical Review X. 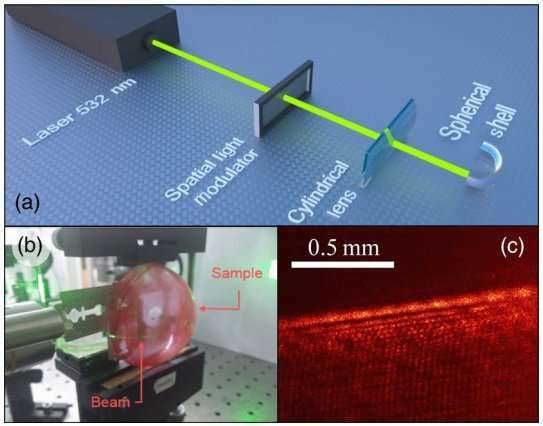 In their experiments, the researchers first transformed an ordinary laser beam into an accelerating one by reflecting the laser beam off of a spatial light modulator. As the scientists explain, this imprints a specific wavefront upon the beam. The resulting beam is both accelerating and shape-preserving, meaning it doesn’t spread out as it propagates in a curved medium, like ordinary light beams would do. The accelerating light beam is then launched into the shell of an incandescent light bulb, which was painted to scatter light and make the propagation of the beam visible. When moving along the inside of the light bulb, the accelerating beam follows a trajectory that deviates from the geodesic line. For comparison, the researchers also launched a nonaccelerating beam inside the light bulb shell, and observed that that beam follows the geodesic line. By measuring the difference between these two trajectories, the researchers could determine the acceleration of the accelerating beam. Whereas the trajectory of an accelerating beam on a flat surface is determined entirely by the beam width, the new study shows that the trajectory of an accelerating beam on a spherical surface is determined by both the beam width and the curvature of the surface. As a result, an accelerating beam may change its trajectory, as well as periodically focus and defocus, due to the curvature. The ability to accelerate light beams along curved surfaces has a variety of potential applications, one of which is emulating general relativity phenomena. The results could also offer a new technique for controlling nanoparticles in blood vessels, microchannels, and other curved settings. Accelerating plasmonic beams (which are made of plasma oscillations instead of light) could potentially be used to transfer power from one area to another on a curved surface. The researchers plan to further explore these possibilities and others in the future.